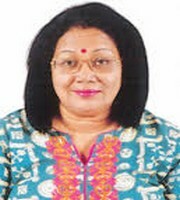 Smita Sinha is presently the professor and Head in the Post Graduate Dept. of Linguistics, Berhampur University Odisha. She obtained her M.A and M. Phil degrees in Linguistics from the University of Delhi and PhD from Berhampur University Odisha. She is a serious researcher and her area of interest ranges from Sociolinguistics, Applied Linguistics, Tribal Linguistics, to Communicative Skills and Gender studies. She has published more than 50 research articles and has guided many PhD and D. Lit scholars. She has participated in many national and international conferences.